Sunflowers are colorful flowers that look stunning when in full bloom. Aside from being pleasant to look at, sunflowers provide us with seeds that are packed with lots of healthy fats, fiber, protein, vitamins, and minerals. If you want a healthy and top-quality sunflower seed snack to add to your diet, grab a bag of Zumub Sunflower Seeds! Due to its nutritional richness, sunflower has been used for years in form of oil and seeds. Sunflower seeds are naturally composed by vitamins and minerals, such as vitamin E, vitamins from complex B, calcium, magnesium, potassium ad phosphorus, healthy fats, protein, and fiber – making them an excellent go-to snack whenever you feel your hunger setting in. 100g of Zumub Sunflower Seeds offer you 24.4g of protein and 13.8 of fiber. 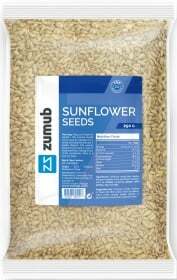 Zumub Sunflower Seeds may be eaten right out of the bag, whole or crushed, or mixed with other types of seeds. You may also use sunflower seeds for maximizing the taste, texture, and nutritional value of your favorite shakes, baked goods, breads, cereals, salads, yogurt, porridge, and sandwiches. Enjoy the natural goodness of top quality sunflower seeds that will support your healthy and physically active lifestyle... try Zumub Sunflower Seeds today! Have a question about Sunflower Seeds? What is it, what does it do, how and when to use or something else? Ask us. WARNINGS Sunflower Seeds : Keep out of reach of children. This product should not be used as a substitute for a varied and balanced diet & healthy lifestyle. This product should not be used in case of hypersensitivity or allergy to any of its constituents. BEST BEFORE: Please see lot number and expiration date stamped on the packaging. Store in a cool, dry place.